Raising my kids to be respectful, responsible, and gracious are incredibly important to me and while most of the time they are wonderfully sweet kids, like all children, they certainly have their moments. I've found that catching them being good and rewarding them for great behavior goes a long way and works really well for us. 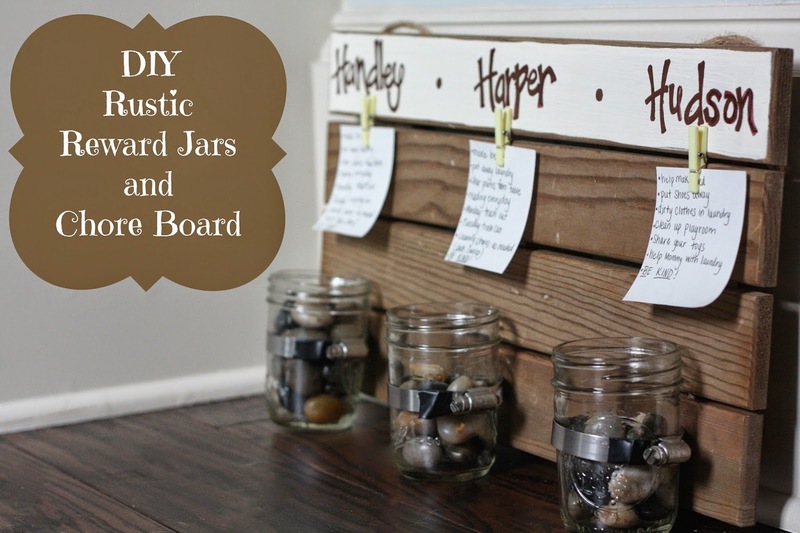 When Little Mama was only 3 I started doing something we called "marble jar" as a reward system for her. She would earn marbles to add to her jar for good behavior and when the jar was full she would get to pick a special treat or outing. It worked like a charm and we started doing it with Blondie as she got little older, too. Then our house went on the market so I put the jars away and they were long forgotten. Fast forward a few years to when were finally settled in our new house and I knew I wanted to reinstate a similar reward system. I also wanted to incorporate chores into this system because they LOVE helping around the house and BEG for jobs to do to help me out. Beg no more my loves, because now we have a nice organized way to keep track of their chores, their responsibilities and their good behavior. I found this wooden pallet at Hobby Lobby and knew it would be perfect for what I wanted to create. It was $19.99 and I used my 40% off coupon! If you don't have a Hobby Lobby near you, I found the exact same ones on Amazon HERE. There are actually several different sizes and brands you could choose from. See all of the options HERE. I have three kids so I knew I needed 3 small mason jars and adjustable hose/pipe clamps (I got from my local hardware store) to complete this board. I nailed the clamps onto the board, but they weren't holding that great and it was tough to nail, so the Mr. came behind me and screwed them into place. Next I put the jars in the clamps and tightened them before cutting off the excess length of the clamps. I wrapped them in electrical tape because the edges were very sharp and I was worried about someone cutting their finger. I painted the top piece of the pallet and added my kids names with a paint pen. Then I hot glued little clothes pins that I found in the scrapbook section and added a list of chores and responsibilities for each kid. I wanted to be able to switch them out easily, so this works perfect. The kids earn a rock for each thing they do not he list and also for good behavior. Basically my goal is to "catch them being good" and reward them for it. If I see them sharing something out of the blue or helping one of their siblings without being asked, they earn a rock. If I really need the playroom cleaned up pronto before bedtime, I'll offer a few rocks to whoever helps and they are speed cleaners. When their jar is full they can either choose to pick a small treat ($5-10 toy or item) or go on a special outing (frozen yogurt, a trip to the movies, etc.). I started out thinking I would give them allowance each time their jar is full, but they aren't quite at the age yet where they want the money and they would rather have instant gratification. I knew I wanted this to be in a place where the kids would have access to it and that would be within their reach. It is hanging on the window in our kitchen that looks out onto the screened porch. I used a heavy duty command hook to hang it. I keep a large mason jar of rocks sitting on the window ledge so the kids can easily add to their jar when needed. Click HERE to find the rocks I use. We've been using this for about 8 months now and I can say it has really helped me achieve what I wanted it to. 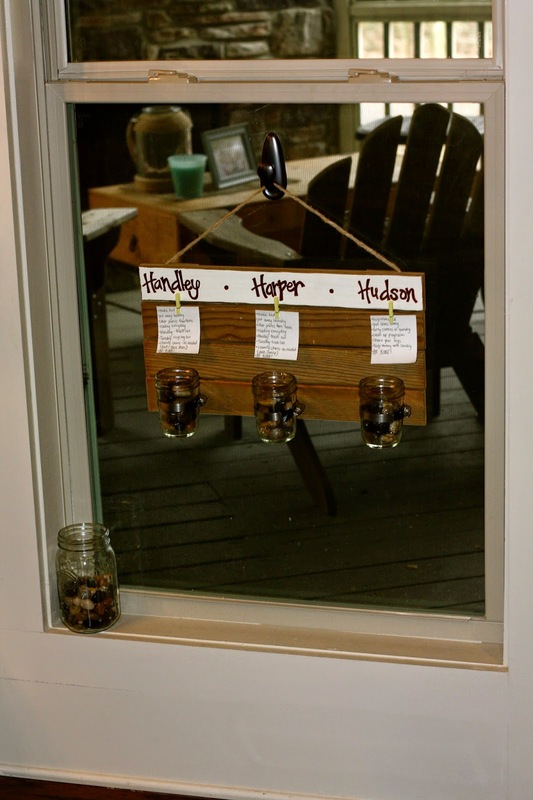 It is functional, kid friendly, and a very simple way to keep track of and reward their good behavior. I've had a few friends make similar ones for their families and they love it, too!